I would like to share a beautiful story that has inspired me for many years; it is from the Bhagavat Purana. It may sound impossible for us to try to practice. But great souls – it is impossible for us to imitate them – but by their incredible activities they are establishing a standard that we can strive for. And as it is said, if we are sincere, by the power of grace this potential can be awakened within all of us. There was a man named Rantidev who had no attachments to any material possessions. He was a deep devotee, a bhakta, and his whole family was very much with him. So one time they went out to the forest in order to purify themselves and in order to bestow blessings upon the world; they fasted for 48days. They were in a secluded place. They were at their limit, at the verge of death, and someone brought them lot of nice food (Prasad) and some water. They were trembling; they were just about to eat. At that moment a Brahman, a priest of the Vedic age came to their little forest dwelling and said, “I am hungry, please give me food.” So Rantidev fed him to his full satisfaction. Then he distributed the food among all of his family members, and as they were all about to eat, a person who really had no caste at all, he came to the little dwelling and said, “I am hungry, please feed me.” So Rantidev had his whole family eat and then he fed this person. What was left he was about to take himself, and then this man came with a pack of dogs. 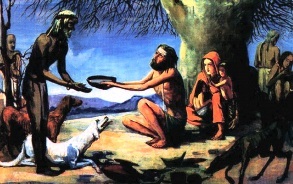 And he said,” I am very hungry and all my dogs are very hungry; please feed us.” Rantidev gave all the food to the man and the dogs, because the dogs were really hungry. There was nothing left except a glass of water. That was enough to sustain his life. As he was about to drink the water, a Chandala, who was considered by society in those days to be someone like a criminal person who is totally neglected, and that person said, “Please. I am so thirsty; give me water.” Rantidev, with folded hands, offered a prayer. He prayed to his beloved Lord, “I do not pray to you for mystic siddis, for the yogic perfections of performing miracles. I do not pray to you for the cessation of suffering. I do not even pray for you for liberation. I only pray one thing: let me take birth again and again and again as long as anyone is suffering in this world. And allow me the great blessing of sacrificing my life to alleviate other’s sufferings.” Then with tears in his eyes he said, “By giving this chandala my water (which means his life), I will be ever liberated from all hunger, all thirst, all lamentation, all moroseness, all anxiety and all illusion.” And then he gave the water; that person drank it. And here he was; there was no water or food for miles and miles, and there were no cars in those days. At that time the devas, the celestial beings – Brahma, Shiva – they manifested themselves. All those people that came were actually them in disguise. They said, “We wanted to show the world what the quality of an enlightened person actually is.” It’s not about the external designations we are always fighting about; it’s about this quality of true compassion. They said, “We are so pleased with you; we want to offer you any benediction you like.” Rantidev said, “I already asked my benediction; I don’t want anything else. Just let me always be in that divine state of love and compassion for all living beings.” This is the purpose of life. This valuable human existence gives us the opportunity to associate with enlightened beings and realize our true spiritual potential, beyond birth, beyond death. 5 Responses to "A standard of compassion we can strive for"
What an ideal Rantidev was. Thank you very much HH Radhanath Swami Maharaj for sharing this wonderful story. Superb explanation. Jai Gurudev !! Superb article. Jai Gurudev ! !